Ready to tantalise your tastebuds, discover the Silk Islands or be introduced to Phnom Penh’s vibrant nightlife? These five amazing day trips are perfect ways to take a guided tour of Phnom Penh – ideal for adventurous travellers looking to make the most of their stay in Cambodia’s capital. Last year we introduced you to the most popular ways to spend an afternoon and evening in in the capital. With suggestions covering tourist attractions, shopping at local markets, and Phnom Penh nightlife, there were enough activities to create a challenging itinerary. But we only scratched the surface, exposing the most common suggestions. Today we embark on a journey down the road less travelled, introducing you to more dynamic ways to experience this beautiful city. Over 8,000 people a year rely on Grasshopper Adventures to guide them to the most interesting and exotic locations in South-East Asia, including Phnom Penh. Traveling by bike or rickshaw, this is an intimate and environment-friendly way to take a guided tour of Phnom Penh. hand introduction to Cambodian culture and the amazing people who call the Silk Islands home. 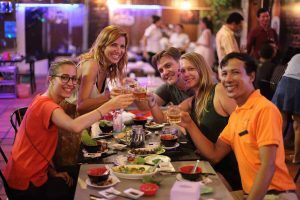 If you’re one of the many tourists who think the best part of traveling is exotic cuisine, there’s no better way to treat your palate than the ever-popular Urban Forage, featuring the lovable Ducky who is arguably Phnom Penh’s most charismatic tour guide. 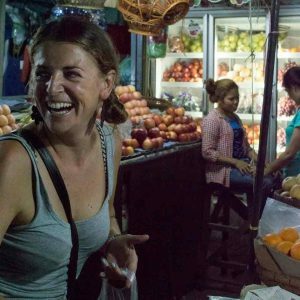 Ducky’s passion for local treats has led to the creation of memorable adventures like The Morning Market Tour, Evening Market and Local BBQ Tour, and the Phnom Penh Roving Dinner. 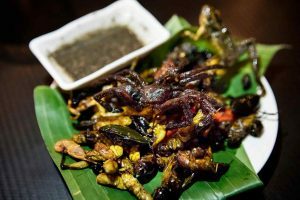 Ducky knows the terrain and people well, which means you can experience Phnom Penh like a local, whether you’re surprising your tastebuds (fried bugs and spiders are optional!) or enjoying a frantic but fun tour of the best bars and eateries serving delicious canapés and cocktails. 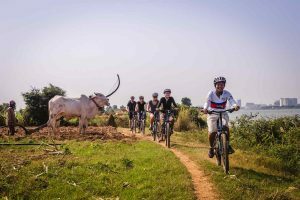 Getting from A to B in Phnom Penh requires some agile manoeuvring, which is probably why Vesper Adventures has become so popular. Like Urban Forage, the tours are built on a foundation of excellent local knowledge, which helps participants experience the culture more intimately. In this case, thanks to the help of experienced riders of timelessly cool Vesper motos, you get to cover a lot of ground, whether you’re traveling the surrounding countryside or experiencing Phnom Penh’s nightlife. This is the cocktail of tours, with a little history, local food and partying. 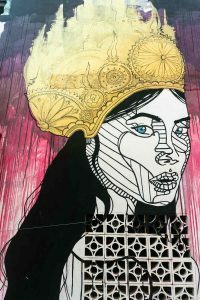 While Phnom Penh lacks the sanctioned murals that add colour to many western cities, there is a lively street art scene. Corralled into a small area around Street 93 near the ‘lakeside’ is an explosion of colourful artistry. While it seems a shame to relegate these creations to a specific region, it certainly makes it easy for travellers to view and photograph the art. Like many attractions in Cambodia, the Boeung Kak Lake area has a sad history. A failed major development led to what looks like a wasteland. There isn’t even a lake there anymore. But the street art is a testament to the creativity, struggles and hopes of younger generations of Cambodians. Some of the pieces transcend what you may usually perceive as street art. It’s easy to take a tour of this urban gallery. Most tuk tuk drivers are familiar with the area, and it’s particularly close if you’re staying in central Phnom Penh. This is a colourful side to the city that art lovers may want to spend a whole afternoon experiencing, but if you’re trying to pack as much into one afternoon as possible, Vespa Adventures Insider Tour includes a visit to the area. Phnom Penh is situated at the junction of three great rivers, including the Mekong, so it’s no surprise that many thriving tours take advantage of these natural wonders. To be honest, Phnom Penh is very urban, and the city’s main focus is rapid development. This means you won’t find huge tracts of land reserved for gardens and parks. That’s why the river magnetically attracts most tourists. Companies like Crockadile Tours provide great boat trips, giving passengers a brilliant view of the city and surrounding provinces while enjoying a little luxury and a few cool refreshments. They can cater for most visitors whether you’re looking for a family day out or an evening of sunset cocktails with friends. As much as we love popular destinations like the palace, temples and museum, the experiences we’ve highlighted above are definitely more vibrant and exciting ways to experience our favourite city. 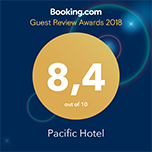 If you decide to take a guided tour, your destination or meeting spot will be close to the centre of the city and the Pacific Hotel, which is the perfect headquarters for your adventures. 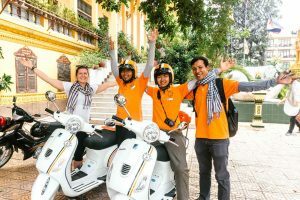 We’re always happy to provide plenty of advice, directions and assistance as you prepare for your introduction to Phnom Penh’s unique culture.